D. Maimon Kirschenbaum represents employees in class action and individual wage/hour cases, individual discrimination cases and other employment matters, such as severance negotiations. Maimon has successfully taken on employers ranging in size from Fortune 500 Companies to "mom and pop" local businesses. From an early point in his career, Maimon has been recognized in the media as a "wunderkind of the plaintiff's bar" and the "patron saint of stiffed waiters." 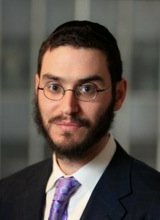 Now a partner at the law firm of Joseph & Kirschenbaum LLP, he is well known throughout the restaurant and hospitality industry and its lawyers as a dedicated and effective advocate for workers who experienced wage and tip theft, wage and hour violations and other unfair and illegal employment practices. He is a nationally recognized class action litigator who has represented tens of thousands of victims of wage theft. His numerous notable cases include some of the largest reported recoveries in wage and hour lawsuits in the state's history. His remarkable work has drawn the attention of numerous media outlets, including the New York Times, the Wall Street Journal, the New York Post, the New York Daily News, Crain's New York Business, New York Magazine, the International Herald-Tribune, The American Lawyer, Fox Business and CNN. He is recognized as the "scourge of restaurateurs" who sought to pad their own profits by denying their workers tips and other compensation to which they are legally entitled. Through his zeal and dedication to low-earning and frequently undocumented workers, Maimon has shown and continues to show New York employers that exploiting their workers comes with serious consequences. In addition to the tremendous success and renown Maimon has earned in this niche area, restaurant industry wage theft is certainly not the only facet of his practice. He also represents victims of sexual harassment and workplace discrimination. He is a member of the National Employment Lawyers Association and the New York State Trial Lawyers Association and is a frequent speaker on both employment law in general and specifically on his experience fighting for marginalized workers in the restaurant and hospitality industry. In September of 2014 Maimon was selected by Super Lawyers® as a Rising Star in the New York legal community. Super Lawyers® is an independent legal publication that utilizes a patented selection process to identify and honor the highest quality lawyers in the legal profession. A Rising Star must be under the age of 40 or have been in the practice of law for less than 10 years. Fewer than five percent of attorneys are named as Super Lawyers® and fewer than 2.5 percent are named as Rising Stars. Employees in the hospitality and other service industries work hard every day for every cent they earn. Yet they frequently feel powerless to resist when their employers adopt policies that divert and withhold their rightful wages in violation of state and federal wage and hour laws. D. Maimon Kirschenbaum has dedicated his career to showing restaurateurs, clubs, and other members of the hospitality industry that they cannot engage in this conduct without consequences, and he has been equally effective in achieving justice for workers victimized by discrimination, sexual harassment and retaliation. Our team at Joseph & Kirschenbaum LLP believes that workers need to have a voice, and we dedicate ourselves to being that voice every day. If you have experienced wage theft, discrimination or retaliation on the job, call our office today to arrange a free initial consultation. We are available by phone at (212) 688-5640. We can also be reached online. Se habla español.